Hops are the pinecone-like flowers of a female climbing plant in the cannabis family of plants. They’re grown on enormous trellises as tall as 18 feet (5.5 meters). Traditionally, hops were hand-picked because they’re so delicate, but that’s a rarity these days. Hops’ unmistakably pungent aromatics (sometimes described as spicy, herbal, floral, piney, and citrusy) are unique; however, prior to the common use of hops in the Middle Ages, bitter herbs and spices, like juniper berries (which are now used to make gin), were used. Beers with strong hop aroma and flavor are said to be hoppy, and beer fans who crave this kind of beer are said to be hopheads. To them, hoppy = happy! Hops’ fourth benefit to beer — natural preservation — was realized several centuries after the advent of regular hop usage. While the alpha acids in the hops are responsible for bittering the beer, the beta acids have been found to counteract and delay the inevitable effects of bacterial spoilage, thereby giving beer a longer shelf life. 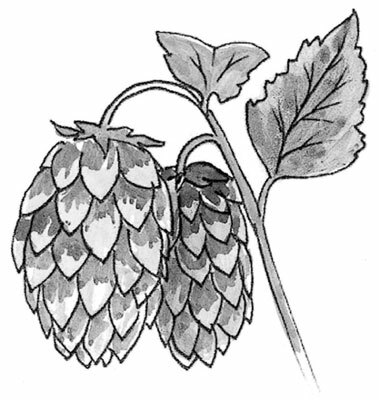 Each kind of hop is distinctive in its bittering, aroma, and flavor profile. The differences between them are sometimes so subtle that even experienced beer judges are hard put to recognize the use of different hops in a given brew. Each hop variety is more or less bitter, just like rejected lovers. Only instead of being measured in the number of forlorn letters and pleading phone calls, hop bitterness is measured scientifically and expressed in terms of alpha acid content, from a low of about 2.5 percent to a high of about 15 percent. Brewers learn these bitterness numbers so they can determine what they call the bittering potential of each hop variety, which allows them to substitute different types of hops (because of availability or price) and to determine the exact quantity of hops needed for a particular brew recipe. They also learn each variety’s unique aromatic and flavor properties, which helps them decide how the hops should be used. The distinctive aroma of each type of hop comes from the essential oils that dissipate during the boiling part of brewing, so some hops are added after that stage in order to get their aroma into the beer, in a step known as late kettle hopping. If the brewer wants even more hop aroma in the beer, he’ll add hops directly to the beer in the fermenter or aging tanks in a process known as dry hopping. Brewers take into account all these variables — bitterness, flavor, and aroma — when designing a beer recipe. That’s why you see hops mentioned on some beer menus. People actually know and appreciate this stuff!